As mass goes, so goes gravity. The earthward acceleration of gravity varies by about 0.5% over the surface of the Earth because of unevenly distributed mass. Exaggerated data visualizations depict the dissymmetrical variations in Earth's gravity field. Gravitational pull varies by location because of unevenly distributed mass in the oceans, continents, and deep interior. Climate-related variables, like continental water balance, and the accumulation or ablation of glaciers, causes the distribution of mass to vary over time. The local gravitational field is measured using a gravimeter. A gravimeter is an accelerometer that measures the earthward acceleration of gravity or G-force. Variations in Earth's gravity field is shown in an image known as the Potsdam Gravity Potato. The Potsdam Gravity Potato is derived from a gravity field model produced by the German Research Center for Geophysics (GFZ). Gravity is a natural phenomenon wherein physical bodies attract each other. Gravity gives weight to physical objects and causes objects to fall when dropped. Gravity is one of four fundamental forces. Gravitation acts across the universe. Earth's gravitation is part of the human experience mediating nearly everything we do. Most gravity has no known origin. Is it some exotic particle? Nobody knows. 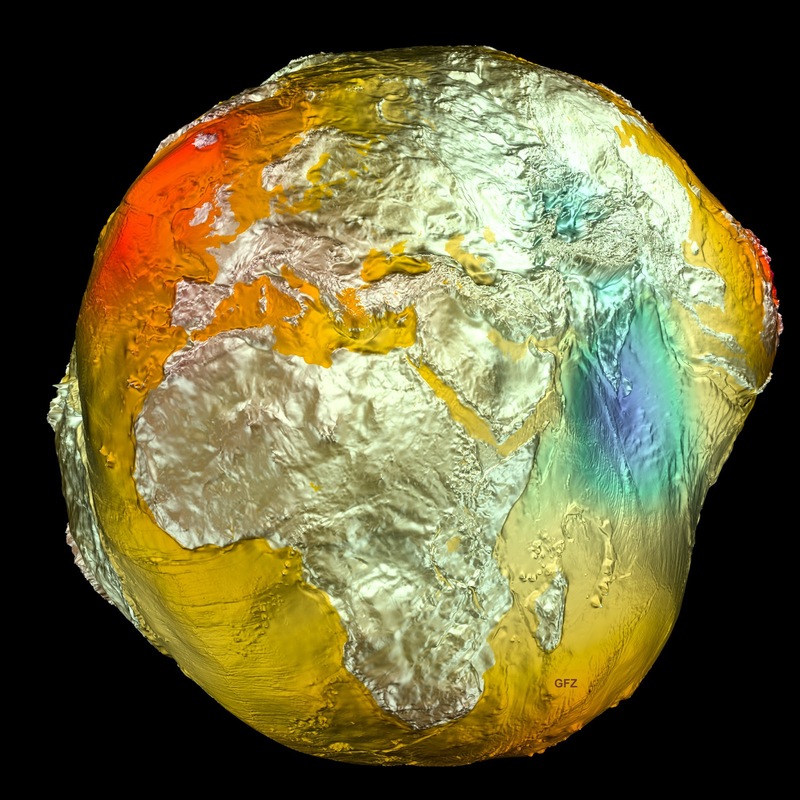 Geoid: The Potsdam Gravity Potato, GFZ - German Research Centre for Geosciences. Grounded, GrokEarth, 12 April 2014. The Potsdam Gravity Potato Shows Variations in Earth’s Gravity, Matt Williams, Universe Today, 29 November 2014.